Sliced bread ... we all grew up with it. I always liked "butter bread," as we call it in the South, and as you see the little Sunbeam girl eating in this ad. In addition to Sunbeam bread, I also remember Colonial bread, Wonder bread, Roman Meal, and wonderful smooth whole wheat bread made at the local monastery. These breads all had one thing in common: they were sliced. Otto Frederick Rohwedder invented the first bread slicing machine in Davenport, Iowa. 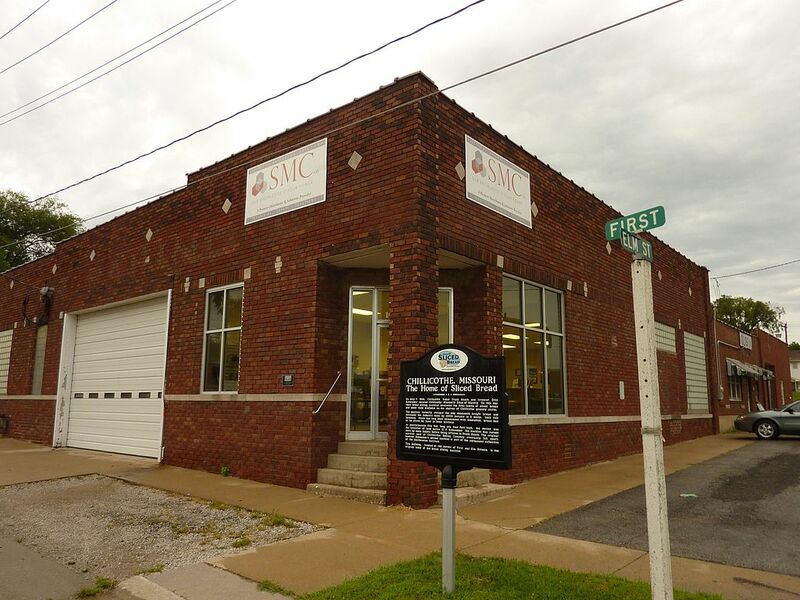 It was first used on July 7, 1928 at the Chillicothe Baking Company in Missouri (pictured below). So sliced bread is 87 years old today! I think I'll celebrate by having a peanut butter and jelly sandwich at lunch. I think a lot of bread bakeries were regional. What sliced breads were popular where you grew up? I'd love to hear from you in the comments, below. Growing up in a small southern town all we had available was Colonial and Wonder Bread. It is funny to me that I hated everything but white bread for a long time but now I cannot stand it and whole wheat is the only bread I like. 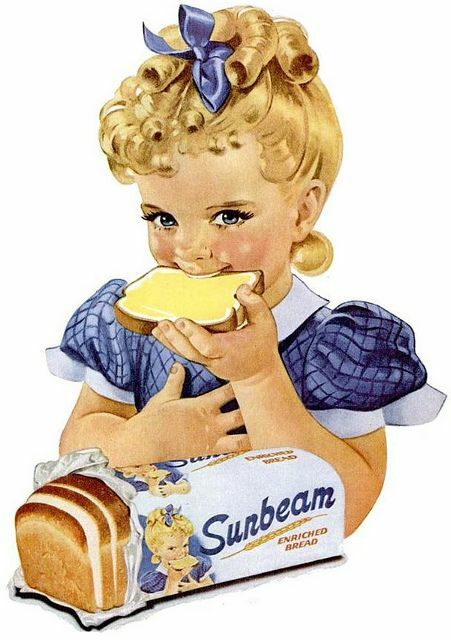 My mother always bought Sunbeam bread when I was young. In 1954 we lived in Nashville, TN, and Fair Park was a popular amusement park nearby. One week the park had a contest to select a "Little Miss Sunbeam" look-a-like. I was entered in the contest, but sadly was not chosen. Every time I see a loaf of Sunbeam bread I think of my one and only pageant! I'm from the South as well so I grew up with Sunbeam and the thick sliced Wonder bread. That was the best for french toast. Now I'm hungry! Wow I did that know that. Happy Birthday to sliced bread! :) Thanks so much for sharing this info! Yay for sliced bread! I grew up eating wonder bread! Nothing like white bread for a pb & j or grilled cheese! Thanks, all for the visits! I always enjoy reading your comments. Mary, that is a great story about the Little Miss Sunbeam contest! Love that. Earl-Leigh, French toast sounds pretty yummy to me, too! I lived in Texas as a kid and remember touring Mrs. Baird's bread. Pretty sure they were regional. What I can't remember if it was for school or brownies/girls scouts! We usually had Wonder Bread and loved it's smooth whiteness. Then for about 15 years, we ate Roman Meal and really loved it. My husband drove past their day old store on his way home from work so he could easily stop by and bring it home. If they were out of that, I believe we ate Rainbow bread that had the same colored package that Wonder bread did - red, blue, and yellow. Wonder bread was advertised on the Howdy Doody show in the 195o's. I still prefer Roman Meal the rare times we can find it. That is neat about Rainbow Bread and also a neat detail that Wonder Bread was advertised on the Howdy Doody Show. I didn't know that! I also love Roman Meal bread, always have.